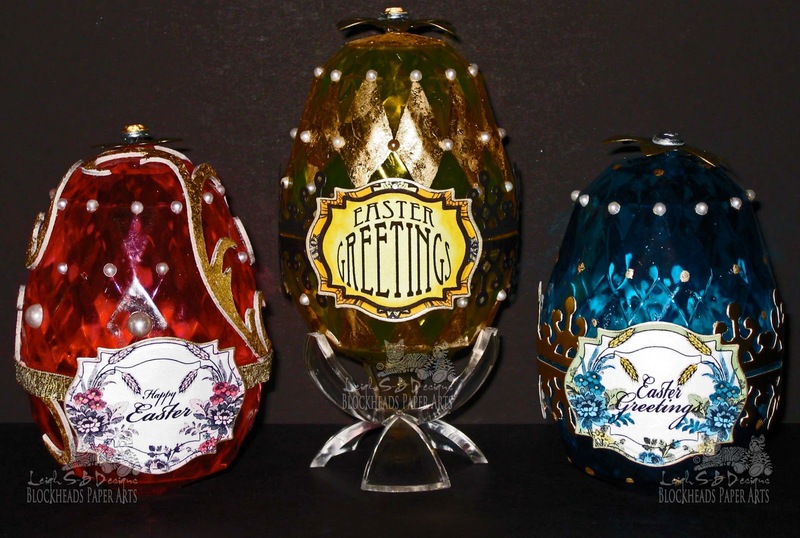 How about an eggs-tra special project to get you in the mood for the Easter Bunny this weekend ;0) I've been eggs-tra busy and I'm super egg-cited to show you my Fabergé eggs! 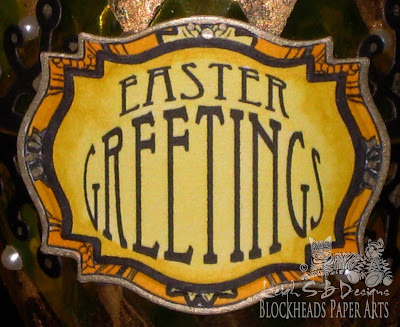 Have you seen the really cool Digi stamps designed specifically for use with Spellbinders dies over at Blockheads Paper Arts? They are super fun and I had an egg-tastic time using the Spellbinders Labels 18 Floral and Elegant digi frames on my Fabergé eggs. You can also get the Digi stamps free if you buy the Spellbinders dies so go check out the ones that are available! They are really easy to use, once you've downloaded them you can alter the size, add your own sentiments digitally or stamp them and the dotted outline guide makes it easy to line up the die and cut them out. The frame in the photo above is the Elegant digi stamp and I adjusted the size to fit the second to smallest Spellbinders Label 18 die in Photoshop to 2" wide. 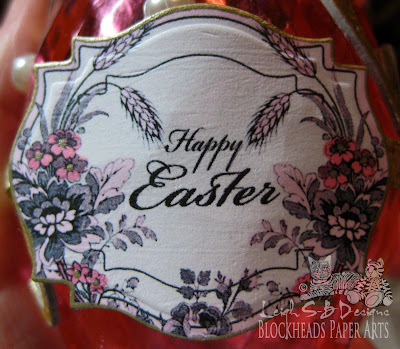 I added the Easter Greetings sentiment in Photoshop too and printed out the design on Neenah Solar White cardstock. Die cut the image with the Labels 18 die and then emboss it with the Spellbinders tan embossing mat. I went for a yellow monochromatic colour scheme for this label and used the following Copic markers: Y11, 15, 17 and 38. I also coloured the inside border black with a Copic Multiliner and added some details and edged the frame with a metallic gold Marvy Le Plume pigment pen. The frame in the photos above and below is the Floral digi stamp and both were adjusted to the same size as the yellow frame and I added the Easter sentiments to both in Photoshop too. I used the following Copics to colour the blue label: Y15 and 17, G21, BG02 and BG07 and edged the label in metallic gold Marvy Le Plume. For the this label I decided to go with a pink monochromatic colour scheme and used RV10 and 13 and edged the label in metallic gold. The inspiration for this one was the result of my printer acting up. The cyan cartridge had come unseated for some reason and the first time I printed everything came out pink and I thought it looked really pretty! I found these really cool crystal cut plastic eggs at Target and they open just like the regular ones. 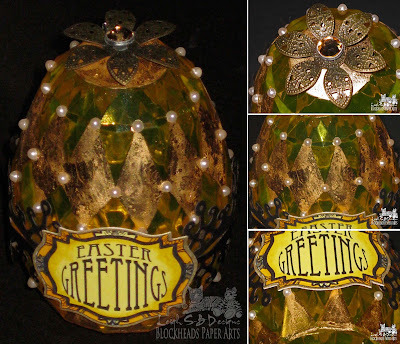 To create the yellow egg I started off by adding gold leafing adhesive size to some of the facets on the top and bottom halves in a harlequin diamond pattern and a circle at the top. Once the glue was ready I applied the gold leafing. Die cut out two borders using Spellbinders Ironworks Motif border die from black cardstock. 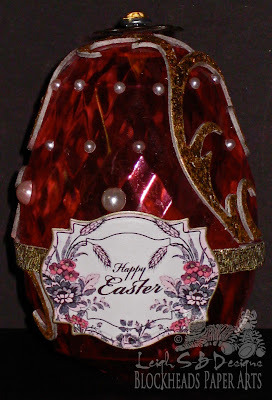 Add gold detailing with the metallic gold Marvy Le Plume pigment pen and adhere the borders to the egg with red liner tape. I lined each one up along the edge of the halves so the egg can still be opened. 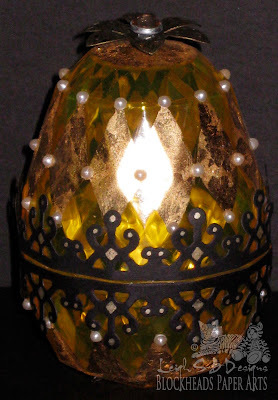 Embellish the egg with self adhesive pearls following the harlequin diamond design I did in the gold leafing. This was a challenging exercise, I was using tweezers to pick up the pearls and they kept going *ping* across my studio...I'm going to be finding those missing pearls for years to come, LOL! Adhere the label to the front of the egg with glue dots and don't forget to just attach it to either the lower or upper half otherwise the egg can't be opened! 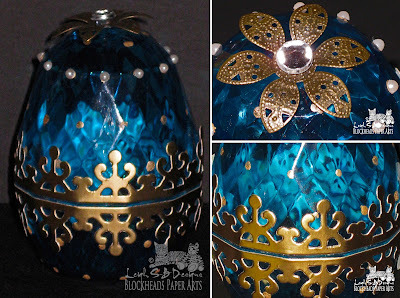 For the finishing touch I adhered the metal flower brad to the top of the egg with a glue dot - I cut off the arms of the brad so it would sit flat. 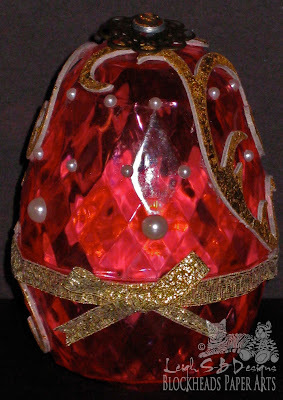 For this egg I added gold leafing dots on the facets with a single line of pearls around the upper half of the egg. I used the same Spellbinders Ironworks Motif border and die cut out two pieces from metallic gold cardstock. 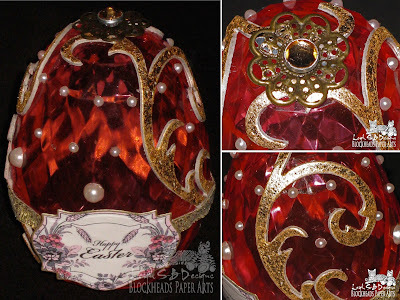 Adhere them to the egg with red liner tape and embellish with another metal flower brad. This one has a clear crystal in the center and the yellow egg has a topaz one. I didn't do any gold leafing on the actual egg for this one. 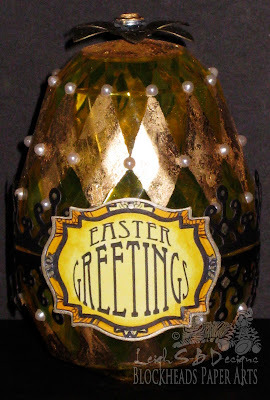 Instead I die cut out two Tim Holtz Alterations Elegant Flourishes from Grungeboard and added the gold leafing to them and then adhered those to the egg with craft glue. I used low tack painters tape to hold the die cuts in place while the glue dried. 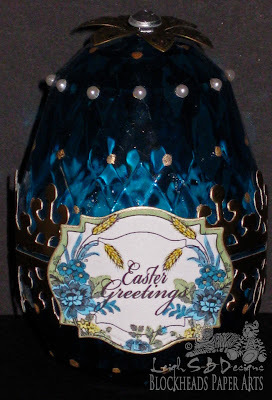 I then adhered metallic gold ribbon around the center of the egg following the join line and adhered a bow to the back of the egg with a glue dot. I created a design with two sizes of adhesive pearls on this one and finished it off with a different metal flower brad with a topaz crystal in the center. I'm so pleased with how these turned out and I think the yellow one is my favourite - which one do you like the best? Looking for more Easter Egg inspiration? 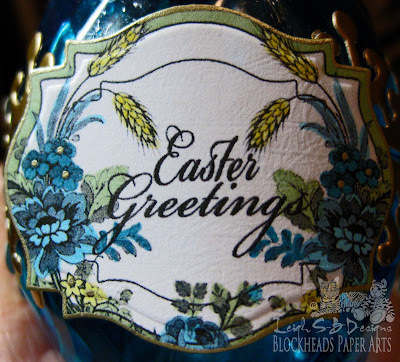 Then check out the popular Spring 3D Pop-Up Easter Egg card I made last year with a template you can download! Thanks for stopping by and have a fabulous egg-citing Easter weekend! Keep safe if you're traveling! Egg-traordinary!!! Great use of the digis!! Marvelous eggs. Wonderful! and agree with all the other comments! Missed out mentioning I love the flower stamp! Beautiful, leigh, in the true fabrege style!